If you liked the movie What the Bleep Do We Know then you will certainly want to read the book titled You Are the Placebo: Making Your Mind Matter by Dr. Joe Dispenza . Dr. Dispenza was my favorite interview in What the Bleep Do We Know. I didn’t know until the end of the movie that he was a chiropractor. I just knew I really resonated with his philosophy. It wasn’t until I heard a recent interview with him that I learned about the accident he had from which he fully recovered. It is an amazing story. I have posted this interview through my Tribeca Chiropractic, PLLC Facebook page. If you are interested Click Here and scroll down a little. It is extremely inspiring. I highly recommend listening to the interview and I am sure you will be curious about the book like I was. It is currently on the New York Times best seller list in the Advice, How-to & Miscellaneous section along with a few of my other favorite authors. Posted in Uncategorized at May 15th, 2014. No Comments. We had another book club meeting last Wed. night at Blossum on Carmine St. It was probably the best meal we have had so far. We have been sticking with vegetarian restaurants which have been okay but Blossum was really good! We discussed the book Start Where You Are: A Guide to Compassionate Living by Pema Chodron. We all agreed it was a great book and a book you could keep coming back to because the topics were very intense. Pema Chodron talks about embracing rather than denying painful aspects of our lives. This was a totally new concept for me. I had heard of Tonglen meditation but I guess I was never ready for it. I have started using Tonglen Meditation more and really like it. After reading this book I feel that I have a new tool to use. Our next book is Everyday Blessings by Jon Kabot-Zinn. Since I started my journey with Mindfulness Based Stress Reduction I have always wanted to read this book. As my daughters get older I see that parenting gets more intricate and complicated. I also feel that teenagers are like cats, which sort of sounds simplistic but was a revelation for me. They want you when they want you and when they don’t, they don’t and you are just bugging them. When they do want to talk to you, be there, because the opportunity will be gone. Being more mindful is always the overall goal. I am really looking forward to reading this book. Posted in Uncategorized at May 14th, 2014. No Comments. I highly recommend this movie! Matt Kapp, one of our beloved patients is one of the producers. The interviews are amazing as well as the footage. When I went to the screening an audience member asked Matt how he got all those interviews. Matt said, “I asked.” Which was so interesting because the people being interviewed had no way of knowing the future outcome of course, so in retrospect the answers are fascinating. You will have to see for yourself. So many people have their own story about 911 and Ground Zero and for those of us who live and work here I think you will find this film particularly informative. Posted in Uncategorized at May 8th, 2014. No Comments. 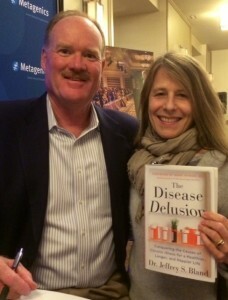 Last week on that rainy Wednesday night Mara and I trekked out to see Dr. Jeffery Bland speak about his new book The Disease Delusion .